If you are remotely interested in crafts, antiques, independent shops, or food trucks, the Treasure Island Treasurefest is the event for you. 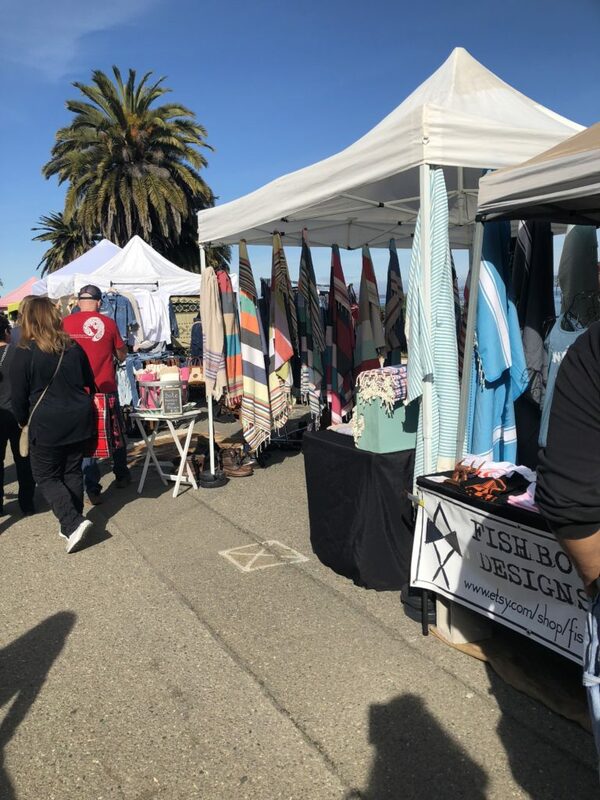 The monthly flea market turned festival on the famous Treasure Island brings together vendors with a crowd of pleasant shoppers, and all around good vibes. I spent January 28th, the first day since the rebrand and reopening, enjoying the sun and picking up a few cool pieces. The festival, today, does a great job of hosting several types of vendors that seem like they belong at different events, together in perfect harmony – ie the DIY terrarium stall next to an army vet’s antique scrounge and vintage clothing outpost. 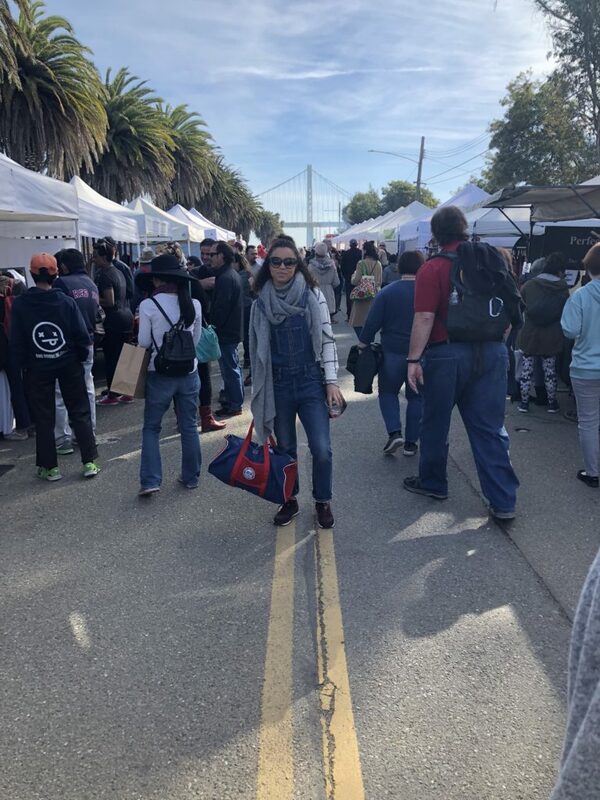 The stalls are situated along a main road on Treasure Island, once you enter the festival it’s a straight shot one way or the other depending what side you enter. We stopped into nearly almost ever vender, pausing to smell teas, stopping to look at art, or to browse through racks of clothing. We got lucky and were able to enjoy a rare sunny and mid 60’s winter day out. 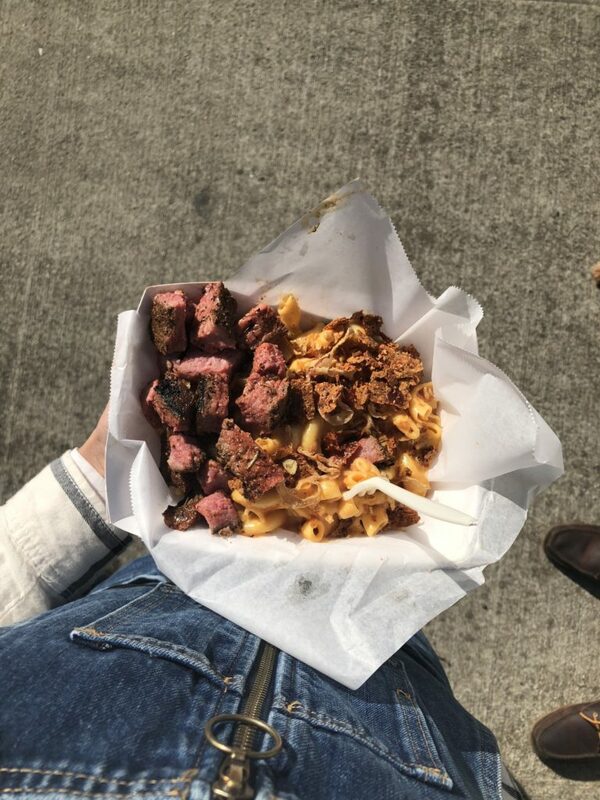 And thanks to the scenic location, even when not browsing booths, I had a great time sitting along the water enjoying a sangria and chomping on mac and tips from the Chomp Station food truck. If you are a dog lover, this place had some serious dog watching. The dog-friendly market was crawling, literally, with dogs of all breeds and sizes, many in awesome fashion. There was even a rainbow poodle out showing his stuff. Get your ticket ahead. They offer some pretty sweet deals for advanced ticket purchase. For the price of one drink ($11), you can get 2 admission tickets and 2 drinks! Get there early. The festival starts at 10 am, and I recommend getting there as close to that as possible. We arrived around 10:45 and during the few hours that we were there, we noticed a lot of the good stuff was snapped up pretty early. After lunch, we saw a lot of sold tags on vintage pieces. Dress comfortably! Walking shoes, layers, some sunnies or a hat are all a must. Bring cash! Some vendors accept cards, but cash is way more convenient to have. Also, avoid the markup on the ATM machines. Put it on your calendar! Treasurefest happens the last full weekend of every month through 2018! 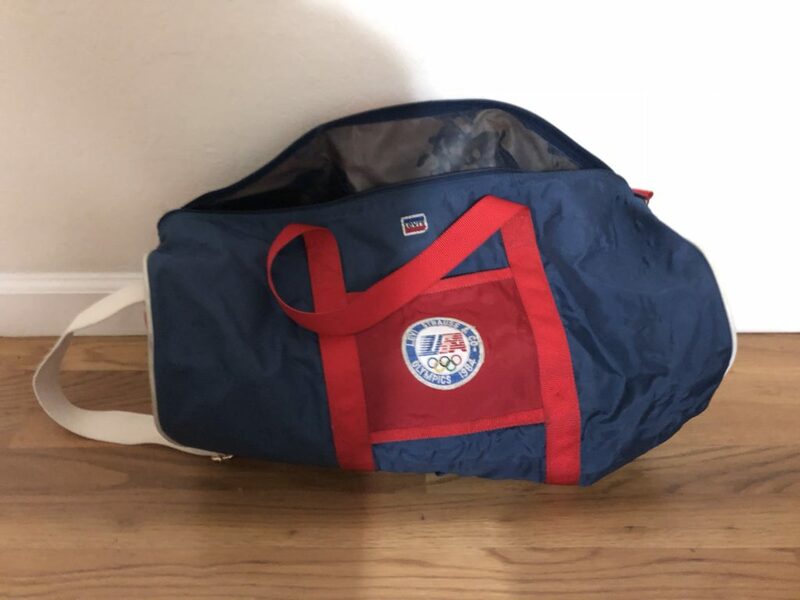 Vintage 1984 Olympics Gym Bag. Umm, how cool is this authentic gym bag?? Since I was little, I’ve loved the Olympics – especially track, with that, I always keep an eye out for Olympic gear. I have a couple things from both the LA and Atlanta Olympics, and it’s great to add this to my collection. I’m excited to actually use this as my new gym bag. A total steal at $5. Tunisian Towel. Our living room was in serious need of a little color, so I came into the festival looking for something with a pop of color to add a little life to the room. 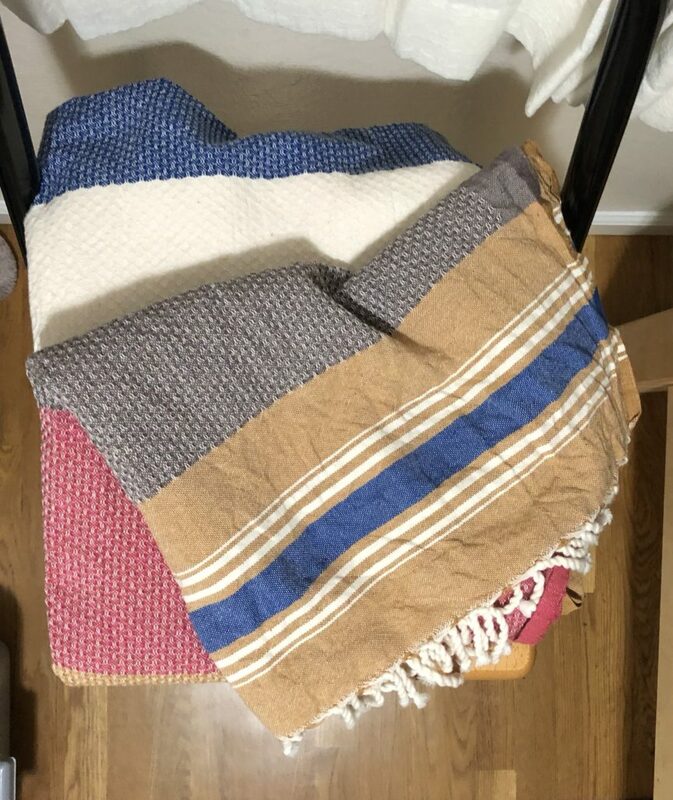 We picked up this towel or lightweight blanket to use as a decorative throw. I think it does just the trick! Can’t wait to go back in the (hopefully near) future! Life Update - I Moved! Previous Post: « Life Update – I Moved!